FamilyFurther is an application that should provide users with free “practical advice” for families. If family is of the first importance to you too, you might want to download this program as well. Actually, we do not recommend doing that, and we will explain you why it is so in this article. Do not worry; FamilyFurther can be removed from the system quite easily, so it is not a big problem if it has already managed to sneak onto your computer. Continue reading this article to find out how to eliminate this untrustworthy application from the system. 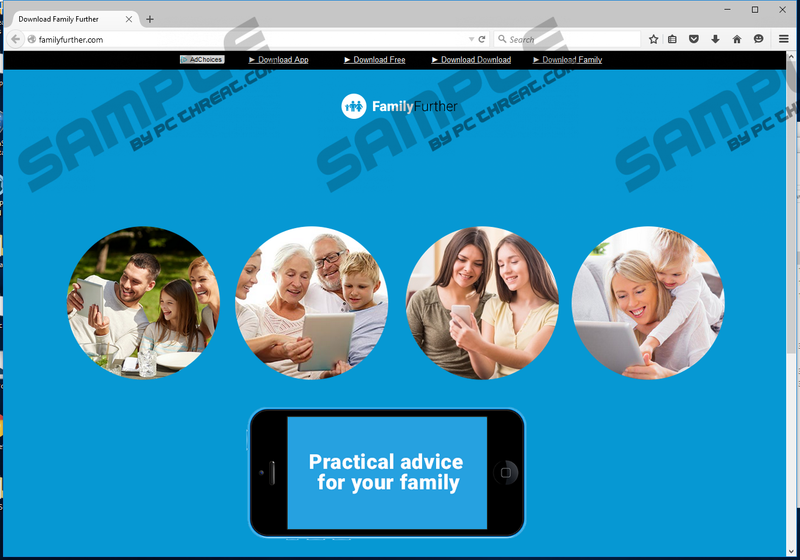 Specialists at pcthreat.com do not trust FamilyFurther at all because it is known to be an advertising-supported application. In other words, it seeks to drive traffic to other web pages, so it is very likely that it will just redirect users to third-party web pages instead of trying to provide them with really useful advice. Research has shown that this program does not even have an interface. If a user double-clicks on its shortcut located on the Desktop, it will launch the window with the FamilyFurther logo; however, it will simply open the website bestfamilyadvice.com for users. There is a possibility that you will find useful articles on this web page; however, we do not recommend clicking on any links available on this site because you might be quickly taken to untrustworthy websites with malicious software on them. It is very likely that users will see various offers and advertisements as well if they use Internet Explorer and have FamilyFurther installed on their systems. You should not click on any of them too. In addition, we suggest that you do not enter any information about yourself in surveys you will be asked to take. It is because this information might be used for really bad purposes and it might even be sold to cyber criminals. It should be mentioned that the content of these offers might differ depending on a user’s place of residence; however, it is very likely that they will all be quite appealing because they will be based on users’ interests. Yes, FamilyFurther tends to collect information about users. It is particularly interested in their activities on the web; however, it is capable of recording IP addresses, search queries, browsing history, and other technical details about the system. Some specialists say that adware programs might also be interested in personal information, e.g. name, surname, etc. It has also been observed that it will create its main folder in %PROGRAMFILES% and %PROGRAMFILES(x86)% too. In addition, it will add the folder to the Start menu and will put shortcuts on the Desktop. The only thing that you can do in order to fix those changes is to delete FamilyFurther from the system. Unfortunately, FamilyFurther is not the only advertising-supported application that exists and might sneak onto the computer. Therefore, it is very important that you take care of your system’s safety in advance. First of all, you should stay away from third-party websites that promote software because you might download malicious software on your computer. Secondly, you need to install a security tool. In case of FamilyFurther, it has been observed that it is spread in InstallCore bundles. Unfortunately, it usually comes together with other threats, e.g. Search Know, Sweet-page.com, and MyPCBackUp. In other words, other infections might be hiding on your system too if FamilyFurther is installed. Detect and delete them from the system ASAP. FamilyFurther itself can be removed via Control Panel; however, you will have to detect and eliminate other untrustworthy programs that travel together with it. Another way to fully erase this adware program is to scan the system with an automatic malware remover, e.g. SpyHunter. The full version of the tool will protect the system from other advertising-supported applications that might try to enter the system in the future. Find and select the program you wish to erase from the system. Quick & tested solution for FamilyFurther removal.